Enjoy these fun Sun facts for kids. Learn how hot the Sun is, how long it takes light from the Sun to reach Earth, what the Sun is made of and more. 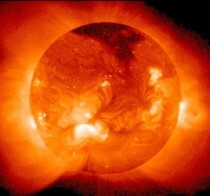 Read on for a range of interesting facts about the Sun. The Sun is a star found at the center of the Solar System. At around 1,392,000 kilometres (865,000 miles) wide, the Sun’s diameter is about 110 times wider than Earth’s. The Sun’s surface temperature is around 5500 degrees Celsius (9941 degrees Fahrenheit), so pack plenty of sunscreen if you plan on visiting (remembering that the average distance from the Sun to the Earth is around 150 million kilometers). Because of the Sun’s huge influence on Earth, many early cultures saw the Sun as a deity or god. For example, Ancient Egyptians had a sun god called Ra while in Aztec mythology there is a sun god named Tonatiuh. The Sun produces a solar wind which contains charged particles such as electrons and protons. They escape the Sun’s intense gravity because of their high kinetic energy and the high temperature of the Sun’s corona (a type of plasma atmosphere that extends into space). A solar eclipse occurs when the Moon is between the Sun and the Earth.